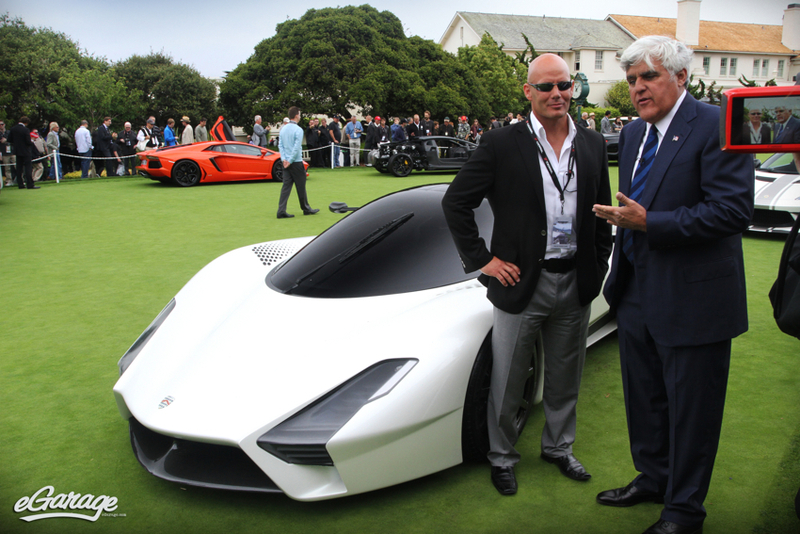 When Jay Leno and the SSC Tuatara locked eyes at the Pebble Beach Concours d’Elegance, eGarage was there to see it all go down. eGarage first caught a glimpse of this SSC concept exactly one year ago at a secret California location where no cameras were allowed. The design model has rarely been shown to the public and was first featured last year on the cover of Top Gear – UK based magazine. 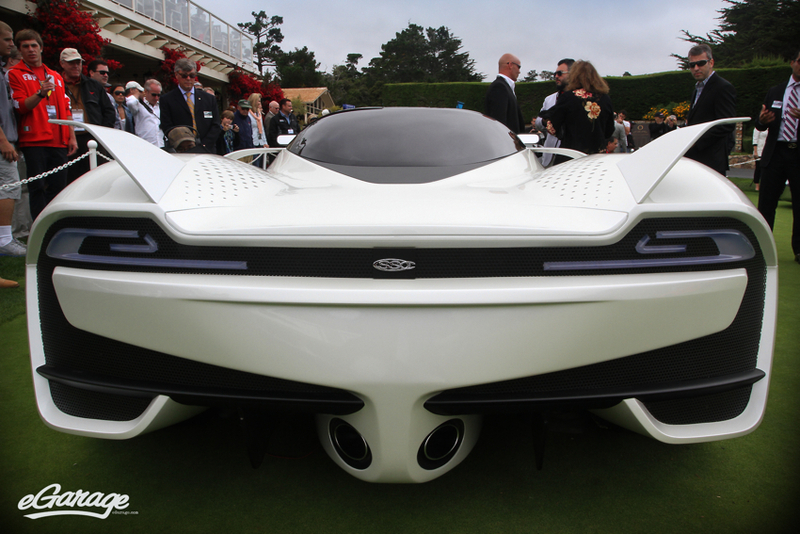 Just a week after the design model (dubbed the SSC Tuatara) made its debut in Shanghai, China the newest ShelbySuperCar was making its first public debut on the concept lawn at Pebble Beach Concours d’Elegance. This was the Automotive world’s first encounter with the SSC design model. Fit with all carbon wheels, Shelby SuperCars firmly placed itself on the front lawn at Pebble Beach – it was a glorious sight! Jerod Shelby and Jay Leno’s meeting, while impromptu was anything but brief. The two talked about the SSC Ultimate Aero‘s previous World Record and how SSC plans to not only build its successor but take back the current speed record held by the Bugatti Veyron Supersport. Jay Leno could hear the determination in Jerod Shelby’s voice as they circled the Tuatara. As the two gleefully talked about the possible million dollar price tag and powerplant, Jay Leno and his entourage were simultaneously shooting for an upcoming episode of Jay Leno’s Garage. 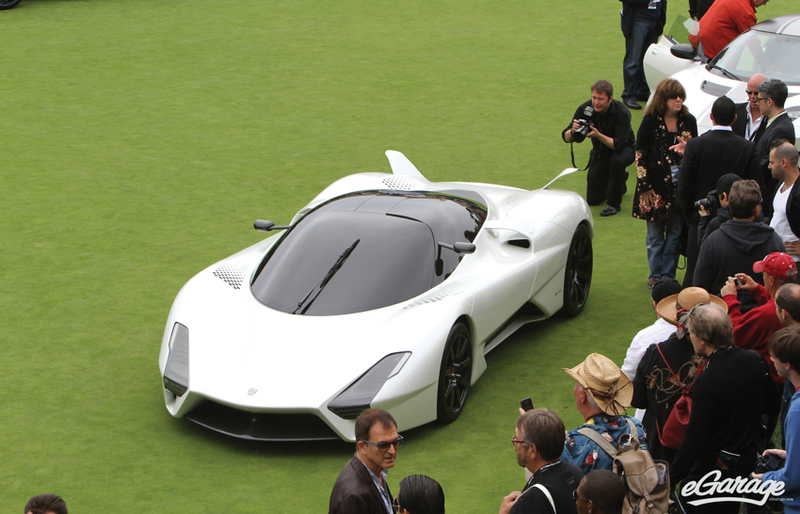 Much of the focus in their exchange was specifically on the topic of how the SSC Tuatara is an “American SuperCar”. 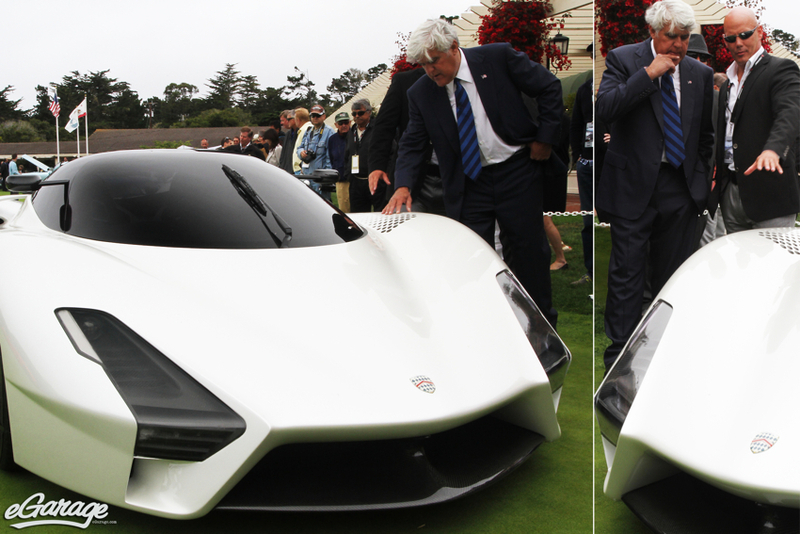 From our perspective, not only was Jay Leno in total awe of the SSC Tuatara but the surrounding mob of camera clicks were in a complete state of reverence as well. With famed designer Jason Castriota behind the design of this next American supercar, we at eGarage have no doubt this will be a tremendous exclamation in American Automotive history. Jason’s portfolio speaks for itself: Ferrari 599 GTB, Ferrari P4/5 by Pininfarina, Maserati GranTurismo, Maserati Birdcage, Bertone Mantide and more. The SSC Tuatara is stunning from every angle, finished in pearl white with carbon accents. Jason’s design elements are generating quite a buzz and it’s quite apparent that other designers are taking note. We spent a couple of days chatting with Jason Castriota and it’s impressive that he has had over a dozen of his Automotive designs on the greens at Pebble Beach Concours d’Elegance. Jerod Shelby hinted to funnyman Jay Leno that a running prototype might be on its way to the Nürburgring sooner than the world might expect, with production cars being delivered to owners worldwide sometime in early 2013. 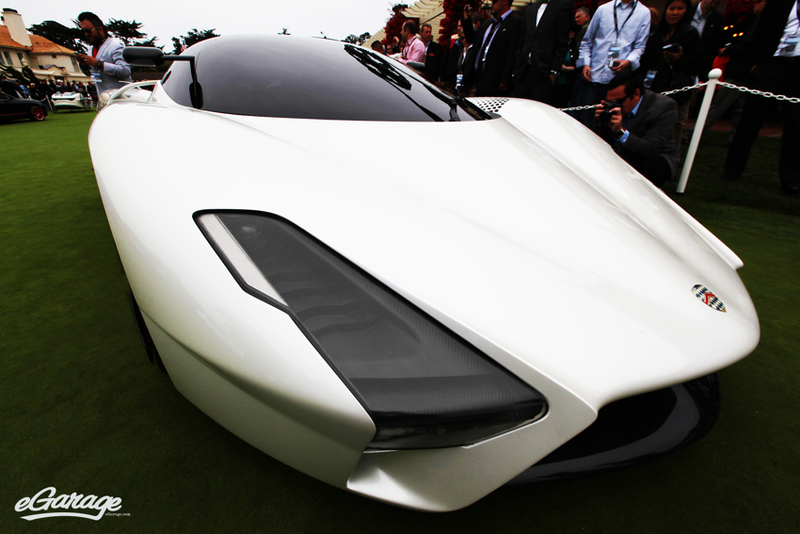 SSC expects to deliver 15-16 SSC Tuatara’s a year with nearly a dozen already spoken for.